With the beginning of a new year, I decided to truly let it all out. The fiber, the yarn, the UFOs. Everything. Just in case my not-so-fibery friends happen across this post and start to worry that I’ve added unidentified flying objects to my hobbies, UFO= unfinished objects… but they can be just as scary. The oldest project in the bunch is the color work mittens that I started last March. So it could be worse, but I’d like to not take an entire year to knit a pair of mittens. The good news is the have been started much more recently and consistently worked on. Next up, my remaining handspun from 2012. 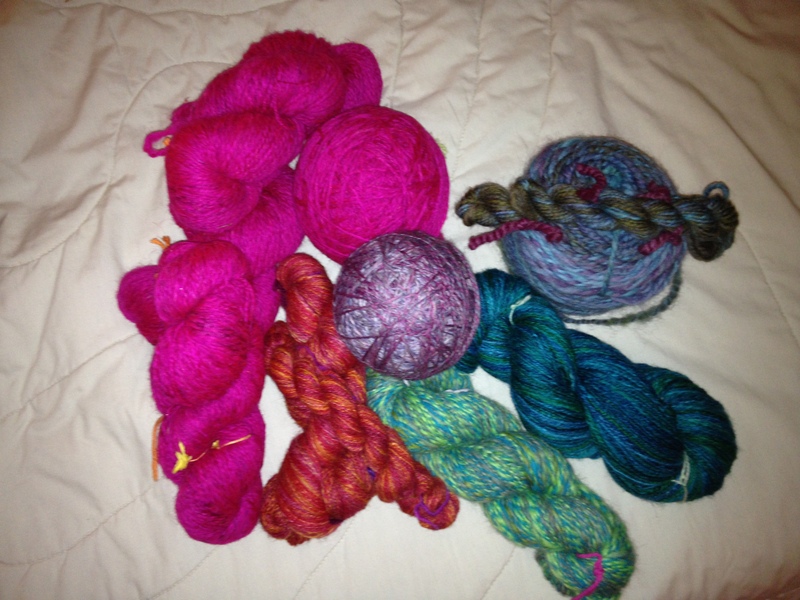 Though there isn’t too much of it, I would like to knit up my handspun yarn a bit sooner. I’m always to excited once it’s off the wheel or spindle, but then find that it sits there waiting for me to find the right project. Some of these already have patterns ready and printed, but for some reason I can’t commit to starting the project. So I’m holding myself accountable for what’s left of last year’s handspun and I hope to knit it all up by the end of this year. That being said, I hope to spin much more this year, so I probably won’t be able to keep up going forward. Now, for the real deal. The rest of the stash. Keep in mind, this is pictured on a queen-sized bed… just to give some perspective. And for even more clarification, this spans the entire length, covers more than half the bed and is three skeins high through most of the pile, with most of the fiber hidden in the back. So where from here? 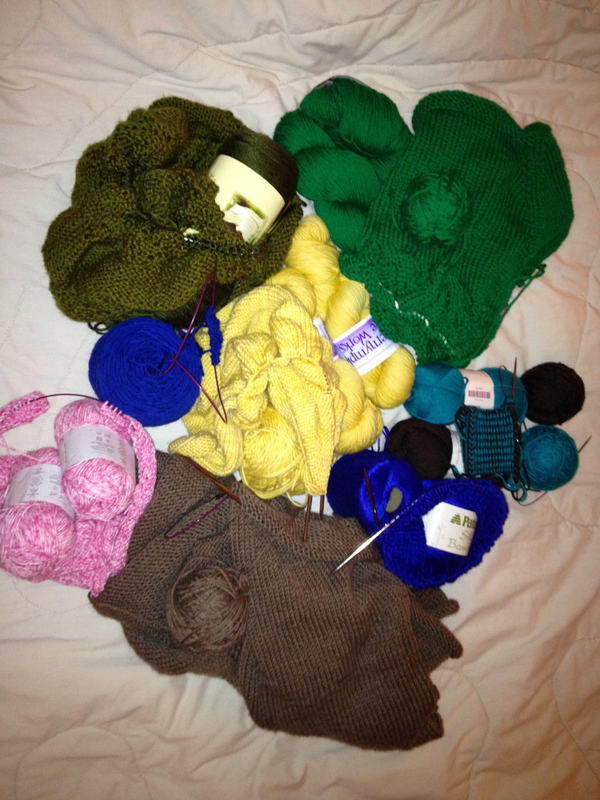 I’m not declaring a “yarn diet”.. I’m not so good at the dieting. I am going to try not to purchase any yarn or fiber outside of that purchased at Maryland Sheep & Wool Festival in May, the SSK retreat I’ll be attending in July and Rhinebeck (NY Sheep & Wool Festival) in October. These major events will have all the yarn and fiber I could possibly want with all the vendors I adore. I plan to save up for these events so that I can buy only the things I will truly love and I don’t already have in my stash. I also have planned out 13 projects for the year using my oldest yarn to correspond with Stash & Burn’s Use It or Lose It knitalong. The hat on the needles now is project number one. Today, I officially have a fiber stash. 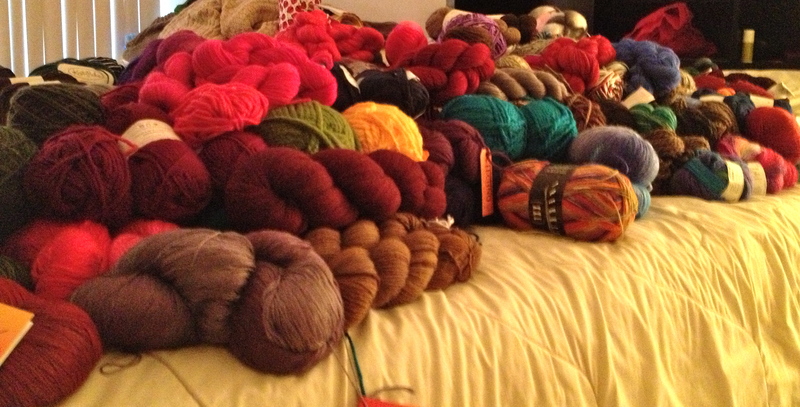 An enormous fiber stash considering I only have drop spindles to spin with. Though I plan to invest in a spinning wheel, I’m far away from saving enough to make the financial plunge. But this didn’t stop me from buying at the Uniquities Fiber Farmers’ Market in Vienna today. Not a bit. Instead, I purchased another spindle to convince myself that this fiber could all be spun. However, the longer I look at the POUND AND A HALF of Romney/Bamboo blend, the more it sinks in that I will have to find a way to store this until I have a spinning wheel. 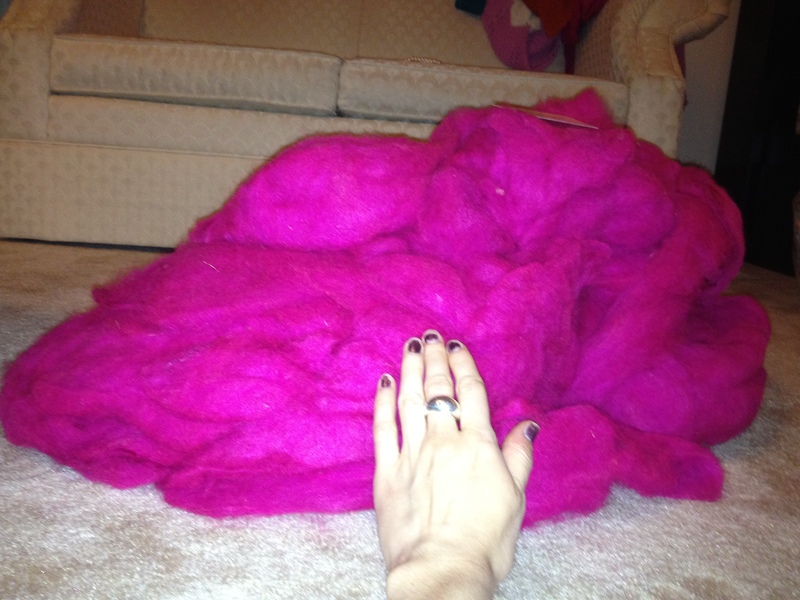 I placed my hand in the shot to give some perspective on how much fiber this really is, but I have a feeling that the love seat behind it may also hint at how large of a pile of bright magenta fluff I now have. But I couldn’t walk away. Even my mother stopped in awe of its beauty. Oh, and it’s soooooooooo soft. I fought the urge to roll around in it after taking its glamour shots. The event, as a whole, was quite intimidating. As we waited a half an hour to get in… do to some miscommunications within the family about what time we were to arrive, the lobby of the community center slowly filled with spinners, many with their wheels for the spinning circle. This was my parents’ first exposure to a mass of spinners and the fiber world in general. It was clear that M was the only one in our group who wasn’t a bit overwhelmed. But I went in with a plan. I needed a new, larger spindle, some fiber wash, to walk around and soak in the fibery goodness and maybe walk out with a braid of fiber. I certainly accomplished this… plus an extra braid, bag of pencil roving and clear trash bag of 1.5 pounds of fiber. 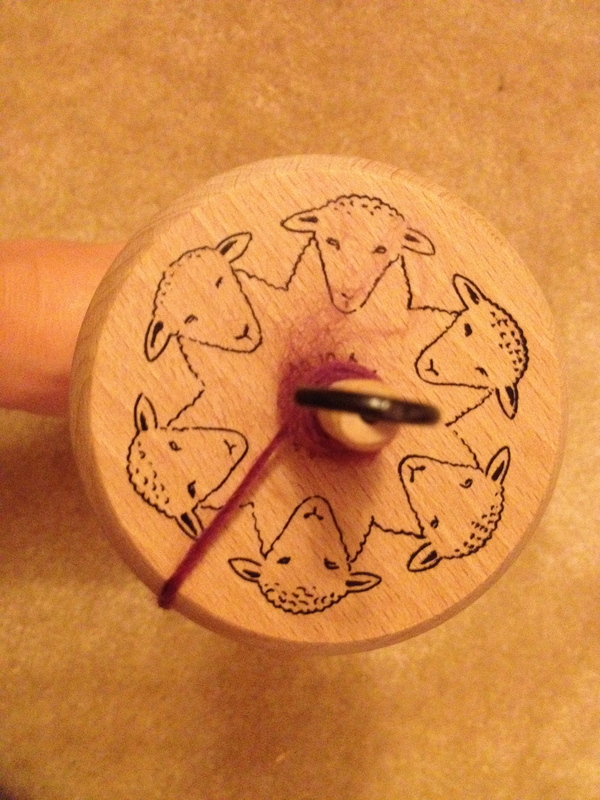 Drop Spindle with sheep heads stamped on the top of the whorl. At this point, my father had taken M outside to eat her cookies, come back inside, washed her up and passed her along to my mother. I returned to the other side of the room, promising that this booth would be my last stop as I had seen some extraordinary colors when making my first pass through the room. 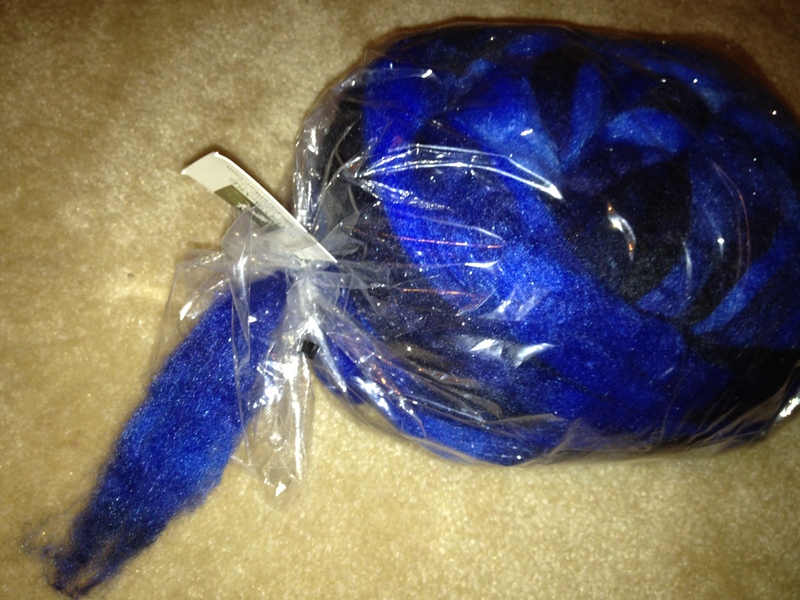 It was at Wild Hare Fiber Studio that I purchased two braids of “Faux Cashmere” and one bag of “Sparkle Roving”. 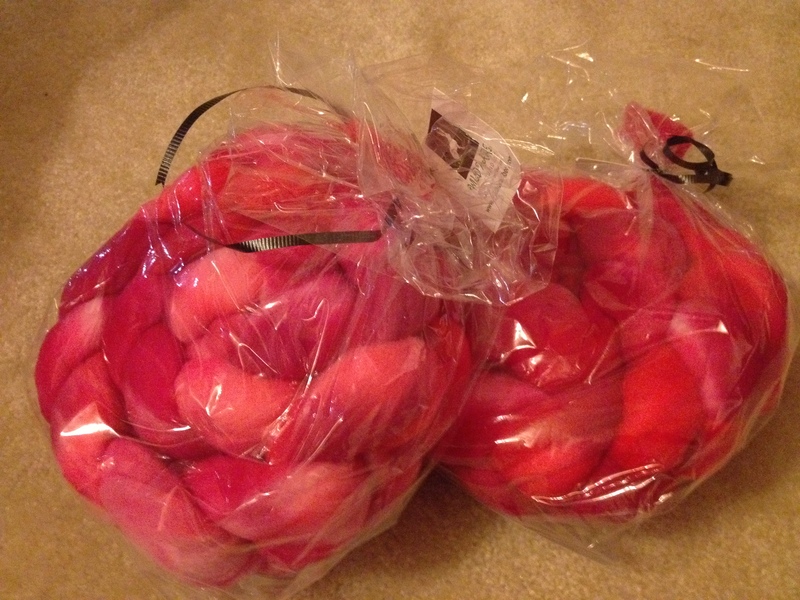 2 - 4 oz braids of "Faux Cashmere" (Microfiber Nylon) in the Rose Petal colorway. 4 ozs of 63% superwash merino 20% silk, 15% nylon, 2% silver poly in the Evening Star colorway. The photos, despite leaving the fiber in their bags, do depict the colors well. The Rose Petal colorway is full of pinks, touches of red and a bit of coral. While the Evening Star is royal blue melting into black with silver sparkle throughout. M gets sick… a lot. She’s two years old, so it’s expected. Unfortunately, every time she gets sick, I do too. We are, however, very different when we’re sick. I just want to lie around and do next to nothing, while she wants to be no where near a bed and instead gets rather hyperactive. So when I found that we needed to take a day off for her to go see the doctor, all the while nursing my own illness, I knew it would be rough trying to get some crafting in. The morning went well, with few tantrums (from either of us) and a lot of snuggling in bed before her appointment. Just how a sick day should be spent. Then we packed up and went to the doctor’s appointment. Of course, I brought both of my drop spindles, more fiber than I could ever spin on a day spent completely by myself, and a simple cable cowl I’m knitting up. Though it was highly unlikely that I would touch any of these at the appointment, I did take the time to carefully choose projects to bring that would require little-to-no brain power. I just didn’t want to risk knitting a challenging project under a cloud of sickness… I needed to just relax and zone out. It was a beautiful day, so when we arrive an hour early to the appointment, we decided to park, roll down all the windows and talk while I pre-drafted some fiber. After a surprising ten minutes of M sitting still, it was time to go inside. Fortunately, we were seen right away and didn’t have to go through the waiting room torture of M racing out of the room every time I tried to sit down. After her appointment and lunch, I thought I would get the lazy knitting and/or spinning time I so desired during nap time. I kept waiting and waiting, trying to calm, getting frustrated, leaving the room, sitting in the room, rocking. I did everything. Almost anything to get my daughter to sleep so I could rest and relax. When it was finally clear that this was a giant waste of time for both of us, I gave up. She insisted on watching 101 Dalmatians and let me spin sitting next to her. It was just what we needed, to revert back to how our morning was spent, lounging and doing very simple crafting. She watched the movie and me spinning and seemed equally fascinated when I relaxed and felt productive at the same time. Now that she’s been on antibiotics for two days, while I continue to get worse, here’s hoping that this weekend is full of relaxing, mindless crafting while lying in bed ignoring the two hour restriction on screen time.